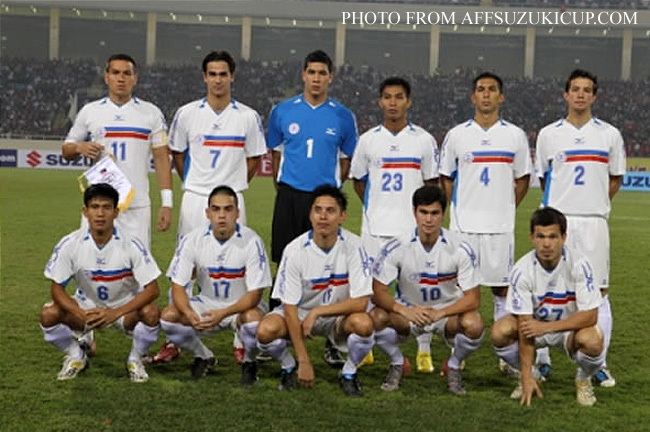 There is just a week to go before the Philippines take the pitch at the Rajamangala Stadium in Bangkok for their opening 2012 AFF Suzuki Cup encounter against the hosts Thailand. Hans Michael Weiss, speaking to the media before the recent friendly against Singapore, made all the right noises. He cautioned that the Philippines’ big name players might not all be available because of club commitments in Europe; but correctly pointed out that the Philippine team would still be strong, anyway, with or without them. In other words, Weiss was being wise. He publicly expressed confidence in the set of players upon whom he relied to win the Peace Cup, thus alienating nobody and all the while gently reminding our Southeast Asian neighbours not to feel too pleased with themselves even if our Europe-based do not all get released. Be that as it may, there is still a certain novelty to sending off our team for a change knowing that it will not be in the tournament merely to make up the numbers. There are no crystal balls in football; but if that recent battling win over Singapore in Cebu is any indication, then we all know that the boys in blue will give all for flag and country. He raised no false hopes; said that he and the rest of team management have set their eyes on the semi-finals as an attainable and realistic target; indicated a readiness to take the tournament no more than one game at a time; but made it plain that his team would not be arriving in Thailand apologetic. He knows that the tournament is winnable; but made no brash predictions about actually winning it. Instead, he will be approaching it with Teutonic pragmatism and meticulousness for planning and detail. The absence of the Europe-based players, after all, was a probability that everyone was always aware of. It is testament to the management team’s savvy that Plan B was actually put into place long before the Suzuki Cup. Plan B would be, as though anyone needed to be told, the recruitment of more quality players to comprise the player pool; persuading a handful of these to play with local clubs in the UFL; and being one of the most active countries in the region in the international football scene. The country’s lofty position among Asean teams in the November 2012 FIFA Men’s Rankings is the result of this. Only the Vietnamese sit above us. Indeed, take a look at the preliminary pool of 35 players; scratch away the ones least likely to be released by their clubs; and you have got to be a severe pessimist or a fool not to come to the conclusion that a strong pool of players still remains. If still unconvinced, compare the pool with the line-up that played in the 2010 edition of the Suzuki Cup – and no disrespect to the 2010 team is intended, as indeed many of them are still present – to get your bearings. And that team, if anyone needs to be reminded, reached the semi-finals against all odds. Who knows how far that team could have gone in 2010 if the organisers had not been so petty on the matter of venues and allowed us to host our home semi-final leg? While the Europe-based players will admittedly make an already strong team stronger, on the other hand how many of our Asean neighbours have Europe-based players to miss? The fact that we do is not only a source of prestige but also shows the potential depth of our squad. It is a sign of their development as individual players if their clubs hold onto them; and for Neil Etheridge – as an example – to keep playing in the Suzuki Cup, while beneficial to the country, will also mean that he is not growing career-wise. The refusal of their clubs to release them on non-FIFA sanctioned dates is the motivation, therefore, for us to aspire higher. No disrespect to the Suzuki Cup; but it is a regional tournament and its matches are registered as ‘friendlies’ on the FIFA web site. The big picture is still, after all, qualification for the Asian Cup and – one day hopefully – the World Cup. When the day comes when we can actually play in those two tournaments, that is when we will thank the gods of football for the players we have sharpening their skills and tactical nous in European clubs. The Suzuki Cup, Weiss and the rest of the national team’s management wisely tell us – albeit in not so many words – is a major tournament but still only a stepping stone to this. We cannot all be dishonest and say that we do not care if we win the cup or not – because we all do – but we all need to keep in mind that there may be bigger things coming even if we do not. Of course, football games are not won on paper; and the Philippines just being in Bangkok does not mean that our opponents will simply lay down and die. On the contrary, ‘lowly’ Laos reminded all of us recently – albeit in a disgracefully officiated match – that even in the footballing backwater that is Southeast Asia, no win is still ever guaranteed. Mind, we had Stephan Schröck in Vientiane. A lot has been said about the Philippines being in the ‘group of death.’ Those looking to scare themselves will be better served by grabbing a DVD copy of Fright Night. In fact, the defending champions and runners-up are in the other group. The final squad is yet to be announced; but whatever team we put out on the Rajamangala against Thailand – and subsequent opponents – next week will be competitive. No other statements need to be made. The Philippine Azkals, led by wise Weiss, will not be flying out to Bangkok to admire the Golden Buddha or shop at the floating market. Thailand will be respected; but with the same respect accorded Bahrain and Kuwait last month, not the respect by an inferior as it used to be not too long ago.